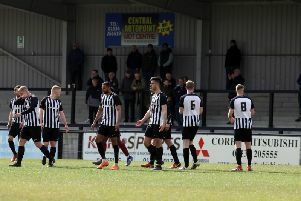 Jordon Crawford is staying on for another campaign at Corby Town. The Steelmen confirmed last night (Thursday) that the young forward, who was the club’s top scorer and supporters’ player-of-the-year last season, has now agreed terms for the forthcoming Evo-Stik South League Division One Central campaign. The news will come as a huge boost for boss Steve Kinniburgh, who has now placed his full focus on bringing in another goalkeeper as he looks to finalise his squad. The Steelmen kicked off their pre-season friendly programme with a 2-1 victory at Stamford on Tuesday night with Elliot Sandy opening his account for the club while an own-goal sealed the success. Young stopper Dan Smith saved a second-half penalty to cap a decent display between the sticks. But boss Kinniburgh has confirmed the clubs are in talks with a Sky Bet League One club about a potential loan signing to challenge for the number one jersey. “The goalkeeping situation is the main area we need to address,” the Steelmen manager said. “Young Dan Smith did really well on Tuesday night and he should be challenging for the position but I don’t want to go into the season with just one keeper. “We have been speaking to a League One club about a loan deal and if we can get it done then I think it will be good for us and good for the player to come here. “Other than that, you are always looking and there are some areas that we may look at. Kinniburgh was pleased with his team’s first match action of the summer as they build up to their campaign. They will be back on the pitch at the Dog & Duck tomorrow (Saturday) as they take on Wellingborough Town. And Kinniburgh added: “It was a good game, it was competitive and that’s what we want. “You always want you pre-season matches to be as realistic as possible to prepare you for the season ahead. “It was a good start for us and, for me, pre-season friendlies are there for two reasons. “Obviously you want to get minutes into players and build up that match sharpness but you also want to start looking at the tactical side of things and making sure the lads understand how we want to go about things once the season starts.